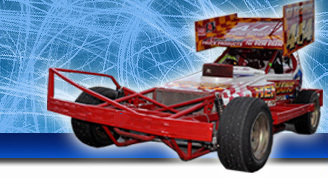 At first glance these cars may look like scaled-down BriSCA F1s but under the skin they are quite different and an excellent formula in their own right. These cars are powered by Rover V8 engines that emit a fine rumble as they lap the ovals, and these drivers are never afraid to use their front bumpers to great effect. The pilots are all very dedicated and determined and always ready to put on a great show. Meetings are held up and down the country for the formula, and in the Midlands the Incarace Gold Cup and the Challenge Series are the fixture highlights.